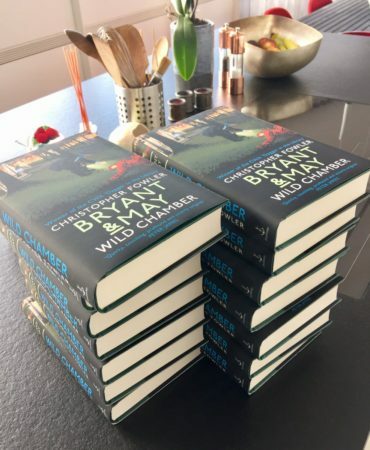 ‘Bryant & May: Wild Chamber’ is here at last – it’s my biggest B&M novel and took a little longer to write than usual because of the huge amount of research I did. However I ended up discarding about 80% of it, something I nearly always do. Not every novel has a lot of research, but I wanted to figure out not only how the parks of London came to be but why parks exist at all. There are so many of them in London, many seemingly accidental, and it’s something you don’t appreciate until you visit cities like Tokyo or New York, where parks feel designated and less haphazard. As well as the purpose of parks I wanted to look at some of London’s park history close-up, and touch upon something else that seems largely uncovered – the feelings that parks inspire and the sense of dreaming they create. I’ve always been interested in understanding how imagination works (that’s what ‘Calabash’ was about) and for a long time I wanted to write a book about films – not the actual films themselves but the gap between the eye and the screen where imagination lives. The creative mind is filled with paradoxes, mindfulness and daydreaming, seriousness and play, openness and sensitivity, solitude and collaboration. When we find ourselves in a calm, quiet lacuna (something that’s increasingly hard to do these days) we have space to think and build something entirely new. We’ve largely taken parks for granted over the centuries. London’s councils are forever seeking ways to make them turn a profit. The park in Harrogate is what makes that very beautiful town so special. It cuts through the middle of the buildings, acting as the town’s defining feature. Its management feels very relaxed and as a consequence it’s used by everyone. So, lots of parks in the new B&M, but also – Raymond Land’s business management skills, a new character, Bryant’s hallucinations reach a peak, an impossible murder, Maggie to the rescue and a siege at the Peculiar Crimes Unit! What’s not to love? Can’t wait, I have been filling in the gap with various random mystery and detective novels. I have even been reading some of the Father Brown stories. I have to say nothing quite fits like B&M. Apparently my copy is arriving tomorrow as is the download of Frightening … excellent. How’d you manage that davem? Arrives in US in December 2017–boo…hiss. But what is a park? The definition is a bit fuzzy. Obviously Hyde Park is a park, as is Regent’s Park. But what about Soho Square, Tavistock Square and all the other squares which the Bourgeoisie don’t lock up to keep out nasty common people like us. They are sort of pseudo-parks. And then there are odd little gardens like the one on a bomb site next to St James’s Church in Piccadilly (complete with its very friendly pair of mallards), the churchyard in Wardour Street, and the bombed ruins of St Dunstan’s in the City. Good luck with the new book. I am sure it’ll go down well. I’m about a third of the way through “Strange Tide” (and loving it) so nice timing for “Wild Chamber” to come out. Perfect timing for my two weeks in the sun….. I am excited to be picking up my copy tomorrow, trouble is it’s always so sad when you turn the last page and it’s all gone. Brooke – you just bite the bullet and order from the UK. Downside is dealing with Amazon, upside is getting the British covers. I’ve read Strange Tide and remember all about it but can’t find the book anywhere in the house so will order a replacement. I’ve cleared a whole shelf for them and I must say the Fowler shelf looks very nice indeed. Am listening to the news from London today and it sounds just like Ottawa a couple of years ago. A good time for Keep Calm and Carry On. Hi Chris, there’s a very positive review of Wild Chamber on Crime fiction Lover website. @ Helen, Kind UK friends are bringing hard copy next week. The downside is that Christopher’s US sales will be one less and numbers count with publishers. Due to publishing contracts, Amazon Kindle will not deliver unless I change my notebook address and have a UK credit card. If anyone has a way around this, please let me know. Brooke, at least you get it in a timely manner. I understand what you’re saying about publishers and sales numbers, but perhaps we could write to the American publishers and tell them what we’re having to do. I suppose part of the delay is the de-deep Englishing of the text. I have just picked up the London Pigeon War and wonder what people would make of that deep English. Helen, Brooke: Or you could just get the audiobooks, like I do. This one is to be released April 20 on Audible, apparently. And at only 15CAD, it’s not a bad price (or just take advantage of Audible’s two free books a year). Cheltenham – but I can’t make marginal comments in an audio book – or underline. Nope, I want my physical book, especially since I don’t have a device on which to listen. I went into Waterstones yesterday “Have you got the new Christopher Fowler Bryant and May book please” “No sorry – sold out” wtf! Noooo.. There was I, geared up for a night in reading, Maltesers at the ready – only to be told – Sold Out! so its on order for Wednesday, where I will be checking my texts all day long like a sad teenager..
Maybe one of my lovely friends going to London this year will get the latest for me. Because December! Of course I have been hoarding London’s Glory to help get me through. But still. Surely publishers must be able to see all of us standing at the metaphorical wharves waiting for our next installment, as people once did for Dickens? Read the latest at one sitting – it gets better, Always read with a dictionary to hand. neighbours wondering at restrained hysteria esp. at Vesta’s nickname – really should have seen that coming ! More please.